VACUU•LAN® local vacuum networks install quickly with simple tools. Installations are limited to lab space, so large diameter, building-wide tubing runs are eliminated, and most labs can be outfitted with a VACUU•LAN® network in less than a day. The chemical-resistant, fluoropolymer (PTFE) tubing is connected with compression fittings without braising or soldering. Networks can be adapted to the needs of the various disciplines by selecting the correct pump – but all network tubing, connections and fixtures are the same, simplifying installation and engineering work. Networks can even be pre-installed in casework and connected in minutes when delivered to the site. A lab-by-lab approach to scientific vacuum systems that saves energy, bench space and maintenance. 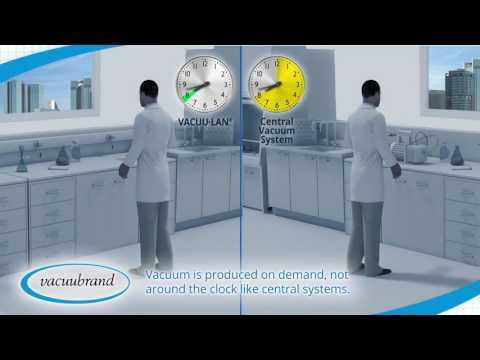 Modular VACUU•LAN lab vacuum networks by VACUUBRAND replace central lab vacuum systems and individual vacuum pumps in new labs and renovated labs. Most lab vacuum is suitable for the simplest tasks, like filtration, solid phase extraction, and aspiration of liquids. Often operating at 100 — 250 mbar, central system lab vacuum is unable to provide the high-quality, controlled vacuum needed for rigorous scientific vacuum applications like sample drying and evaporation of common solvents at temperatures near ambient conditions. As a result, most labs duplicate vacuum supply: central lab vacuum is provided as part of the building infrastructure, but mainly serves chemistry filtration, solid phase extraction, and fluid aspiration applications; dedicated vacuum pumps are purchased as part of lab equipment to support more demanding lab operations. VACUU•LAN® networks eliminate most of this service duplication by providing high-quality vacuum to every lab vacuum port. As illustrated on the Vacuum Scales figure, the small, local server pump in a VACUU•LAN® network can provide vacuum down to 2 mbar/1.5 Torr, so that it can serve evaporative applications well beyond the capacity of a central vacuum system. With vacuum at these levels, even DMF can be evaporated at near room temperature. As a result of this expanded vacuum range, a VACUU•LAN® network can replace central vacuum and dedicated pumps for nearly all lab applications except lyophilization, final drying and molecular distillation, which typically require vacuum of 10-3 mbar/Torr that can only be provided by oil-sealed, dedicated vacuum pumps. Besides the vacuum pressure advantages offered by a VACUU•LAN® network, the vacuum provided is also more stable than that provided by a central vacuum system. With a central vacuum system, users in different labs can degrade the ultimate vacuum capability of the system, as well as causing sudden changes in pressure when ports open and close. These pressure changes can lead to cross-contamination between labs connected to the central lab vacuum system. With VACUU•LAN® technology, check valves in each port isolate applications when a pressure spike is detected, preserving conditions in individual applications until the network vacuum is restored, and the vacuum in each lab is isolated from other labs in the building. When designing a “flexible” lab building, it is not uncommon for system utilities to be run to every location where service may conceivably be needed in the future, and then capped at those locations where no service is required for the current layout. With a central vacuum system, this is really the only option. This approach means incurring nearly the full cost of vacuum supply to every possible location at the time of construction, even if many of those locations will never be needed. It also means oversizing the system pump and building tubing to provide adequate vapor flow capacity and pumping speed for all possible future users. In contrast, with a VACUU•LAN® network, if you are not sure at during design phase whether vacuum will be needed in a specific lab, there’s no need to incur construction costs for vacuum “just in case.” Should you need vacuum in a new location at a later date, a local VACUU•LAN®network can be installed in a day or two, with minimal disruption to a working lab. Further, once a VACUU•LAN® network is installed, the degree of control of any individual port can be changed in a minute or two, without tools, allowing labs to relocate controlled ports as needed. Besides investing only in the vacuum capability that is currently needed, this permits a lab to be equipped with the most economical vacuum at the time of construction with the knowledge that more capability can be added later, if needed.